Here’s a game suitable for little food lovers! 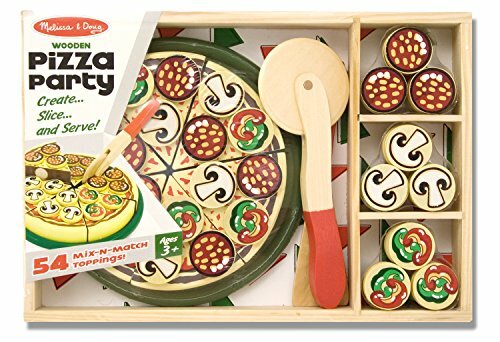 It is a set of wood produced by Melissa & Doug (Melissa & Doug10167) that reproduces the “art” of pizza. The set made of wood, is composed of a base, the plate, on which compose the six slices of pizza. Each slice is already decorated with the basic ingredients of the pizza, tomato sauce and mozzarella cheese but is also available a wide variety of components to enrich each slice like mushrooms, pepperoni and peppers that allow each to compose and decompose your pizza as it will suit your taste. In the set is also included, always it made of wood, a pizza cutter and a recess to serve it, so as to make the game as similar as possible to that of a true pizzeria. The use of the game is recommended by the manufacturer by 3 years of age.